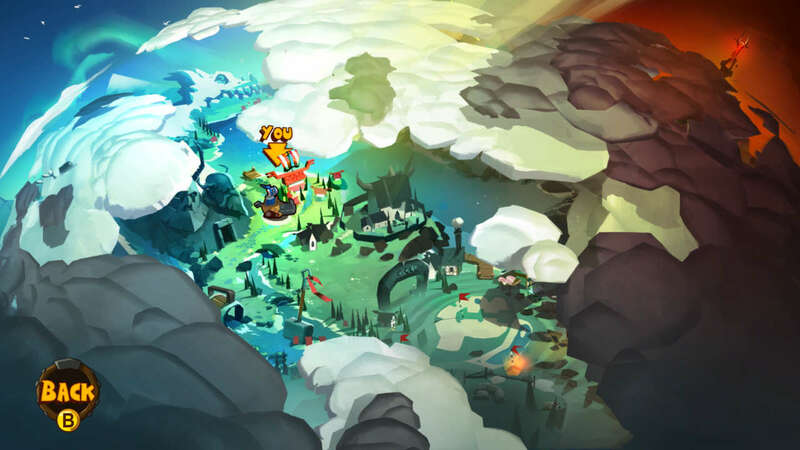 Ever since Nintendo concealed a magic vine in World 2-1 on Super Mario Bros, the company has been obsessed with splicing secrets and wondrous little diversions in its platform games. 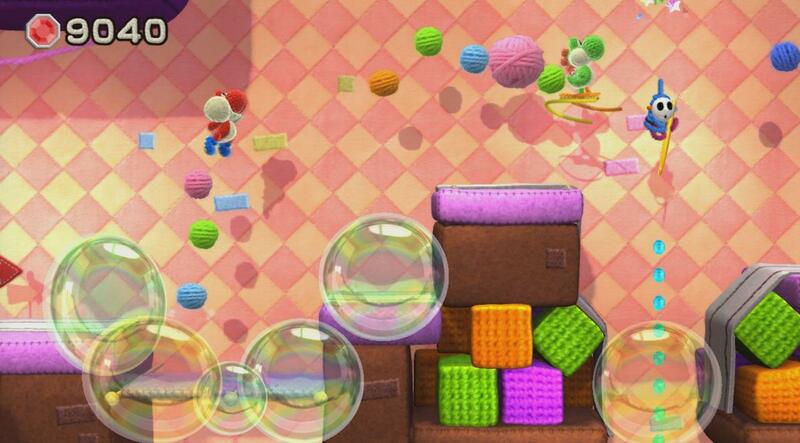 Yoshi’s Woolly World honours this tradition, but also subverts it. Here, finding hidden items is technically an optional side-quest, but paradoxically, it’s also the game’s only real challenge. Should you decide against hunting down Woolly World’s hundreds of secluded items, opting instead to dash across its 48 levels as though you were playing any other Mario platformer, then you’re likely to come away slightly disappointed. Played straight, Woolly World does not inspire enough quick thinking or daring leaps of faith. There’s no time limit, and no lives to lose, which gives the proceedings a measured, pedestrian pace. The boss fights, meanwhile, can be conquered on first attempts. 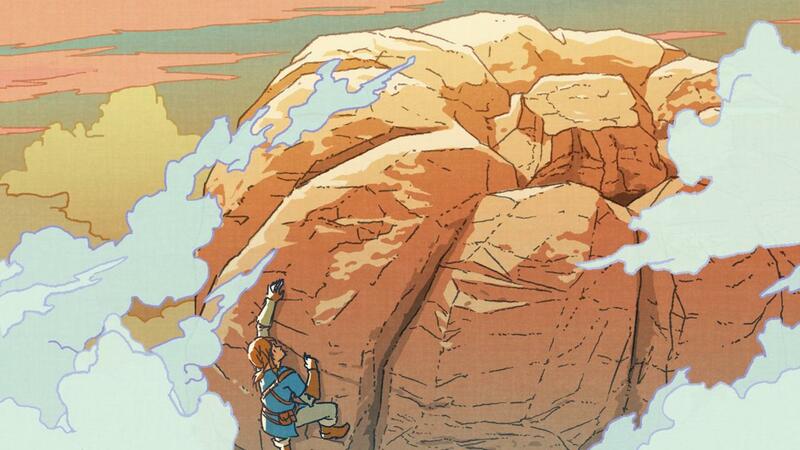 As expected from a Nintendo platformer, the controls are immeasurably perfect and dependable. 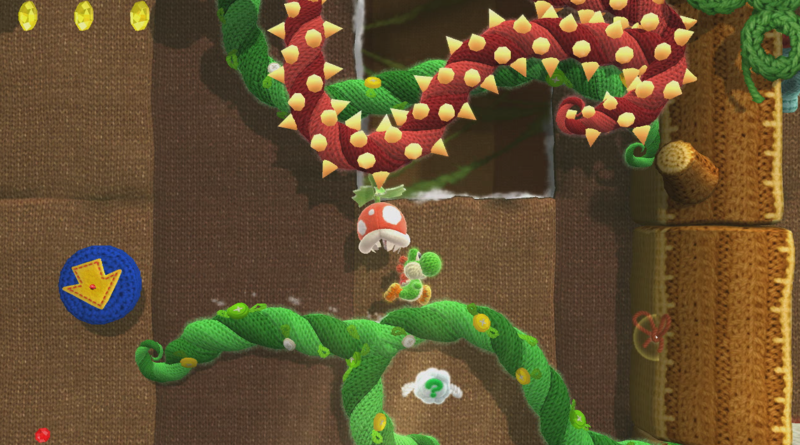 Along with the usual high-jumps, tongue-whips and ground-pounds, Yoshi can also carry balls of yarn with him, which can be tossed at the press of a button. This manoeuvre requires timing, as once you hold down the throw button, a reticule will run up and down the screen, which will determine the projectile’s trajectory upon the button’s release. Care and attention is necessary, as Yoshi only has a max capacity of five yarns, and they are handy in many scenarios, such as activating secret platforms and wrapping piranhas in cotton muzzles. Since the vast majority of foes are made of wool, Yoshi can pull them in with his tongue, and instantly digest them into new balls of yarn. It’s probably not worth mentioning where the balls sprout from. The excellent controls only makes Woolly World easier to finish without many issues. In fact, if you have experience playing the likes of Super Mario World or Yoshi’s Island, it’s likely you’ll be able to breeze through the game’s first half on autopilot: Run right, line your jumps along the craniums of Shy Guys and Koopas, eat foes with a whip of Yoshi’s tongue, and reach the exit on the furthermost-right point of the level. No real peril or heroics; just violent tourism. Fear not; You can still find that inimitable Nintendo sparkle, that magical je ne sais quoi which enlivens your inner-child who is absolutely over the moon that you still play video games. It’s just that, while Woolly World can be wonderfully fun, it’s only so if you choose to make the most of it. Specifically, when each level is finished, a list of collectable items shows all the hidden little treasures you missed along the way, and to unlock Woolly World’s bonus content (such as the rock-hard S-levels, as well as some imaginative Yoshi skins), you gotta catch ’em all. So while it’s undemanding to complete almost any stage in less than five minutes, doing so with the full set of collectables in tow requires scrupulous scavenging and sleuthing, and some of the most fiendishly concealed secrets will evade your best search efforts for upwards of half an hour. This is Woolly World at its best; Moments where you scan the landscape to spot architectural anomalies that could be hiding something, or running into a wall you suspect is a secret tunnel, or leaping into the great unknown outside the screen’s field of view like a cartoon Columbus. The eye-catching art style, which is an ambitious attempt to portray everything as though it’s knitted in wool, naturally offers some excellent hiding places. Tiny loose threads occasionally protrude from giant plinths of cushion, and if pinched by Yoshi’s tongue, unravel soft little bunkers containing various treasures. Other collectables are tucked away behind some of the spongier stacks of pillow, which Yoshi can compress by pushing his whole weight against. 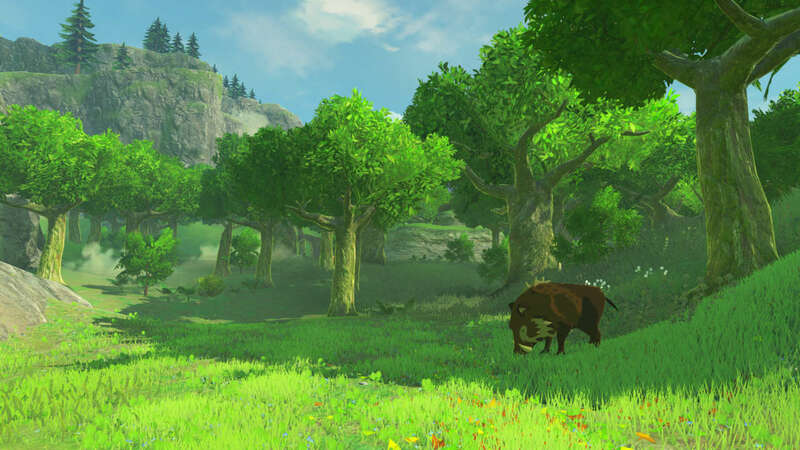 It’s the video game equivalent of finding money down the back of the sofa, and it never fails to satisfy. Whether the plush visuals win your eyes over is another matter entirely. 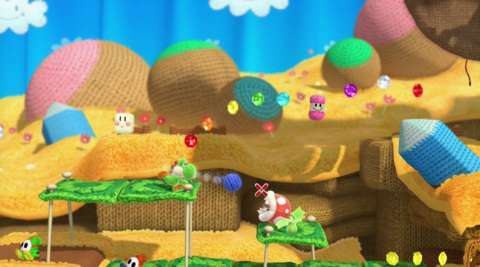 With everything rendered as though it was knitted together, some of the smaller details are sacrificed, which is perhaps why Woolly World sometimes comes off as a little characterless. The charm and razzamatazz you’d expect from a Nintendo game seems to have been diminished, to an extent, in the transition to wool and cotton. That goes for Yoshi too; Some of his animation flourishes seem like excellent ideas on paper, such as how his legs can spin into cotton wheels when he sprints, or when they morph into small propellers as he leaps. In practice, however, they are unexplained and seem out of place. It’s as if fast legs were too complex to animate with virtual wool. But perhaps that’s a tad unfair on something that attempts–and succeeds–to visually distinguish itself from most other Nintendo games, especially since the level design is built upon the Mario Bros template. It’s also pleasantly surprising that a game fixated on treasure-hunting works so well in the narrow horizontal strip of a side-scrolling platformer. Exceedingly well, in fact; better than any other Nintendo game before it. How can so many secrets be tucked into such a flat space? The game’s answer, more often than not, is to conceal its collectable sunflowers (stars and shines were on vacation) inside small question-mark clouds that remain invisible unless touched by Yoshi or his projectiles. Many of these are placed in obvious locations, such as the crest of a jump between platforms, while others require a developer’s intuition (“where would I hide this?”) to know where to look. When you probe a suspected hiding place by flinging one of Yoshi’s yarns at it, and when your inquisitiveness is rewarded with a secret item, a wave of pride passes through you. But on occasion, you need some luck to find every secret, due to the seemingly random placement of some the invisible clouds. Sometimes it seems unreasonable that 99 items were discovered by following the game’s logic, while the elusive hundredth was tucked away in some arbitrary spot in the sky. Fortunately, this is where Poochy comes in, your painfully adorable dog sidekick who–later in the game–can be summoned for 5000 gems (don’t worry, you always have enough). This wonderful little fella sniffs out secrets and bounces around like you’re the postman at his front door when he’s found something. He can also collect items for you from hard-to-reach places, as well as handle nearby enemies for you. Most important of all; when he helps you, he does a little gleeful jig. Hearts will melt. Later on, other major perks can be bought for gems, such as the game-changing ability to make all hidden items visible. This is an invaluable tool for those who want to find absolutely everything, but not to the extent that it feels like you’re playing in God Mode. Between this and Poochy, you’ll have enough perks to make it entirely feasible to collect all sunflowers in every level, and should you put in that effort, your reward is six S-rank courses, which undoubtedly offer Woolly World’s smartest, trickiest, and most creative challenges. But this memorable bonus content, much like everything worth your time in Woolly World, is only available if you choose to hunt it down. You don’t need to collect a single hidden item on your journey from 1-1 to the final boss. Some would say that gives Woolly World its inherent accessibility, in that players aren’t forced to take the hard road. But if you want to be fully entertained, the hard road is the only real option. It is your own degree of curiosity, and your compulsive nature, that will determine which route you’ll take.